You may have noticed lately that there have been more reviews of historical YA? I've had a real change of heart when it comes to historical fiction and I'm still very excited to read more and learn new things and discover new authors. 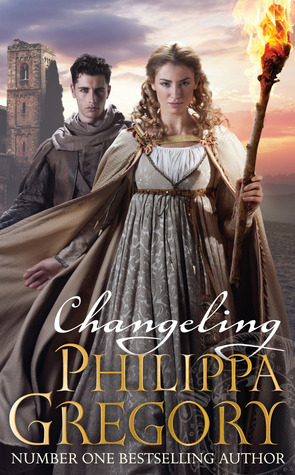 Changeling by Philippa Gregory has been out recently in paperback and I'd kept seeing it about which piqued my curiousity. I've never read anything by Philippa Gregory before and I know her adult historical fiction is quite popular. I did want to see how well I would fare, with this her first offering for YA fiction. Sadly though, I was a little bit disappointed. I was hoping that there'd be lots of historical detail, an intriguing mystery to solve and a sweeping love story. And on all three accounts, my expectations weren't met. It was an interesting story, and I mostly enjoyed it. I just wasn't wowed by anything that I read. At certain points I felt as thought I could quite happily abandon the book and there was nothing particular about the story or the characters that overly grabbed me in any way. And that's a real shame. I did like the idea of it though. The book is told from two perspectives, that of Luca Vero a 17 year old boy who has been kicked out of the monastery because of his challenging intellect and that of Isolde a teenage girl who has been forced into a nunnery after being cheated out of her inheritance. Luca is on this mission from a secret society in order to track down evil and to use reasoning to see through people's fears and superstitions. At the nunnery where Isolde has been made the Lady Abbess, there has been a great difference in the other women since Isolde arrived. Everything points towards Isolde or her servant who accompanied her there, to be using magic or witchcraft that would explain the nuns' visions and strange behaviour. Luca and his servant, Freize and also Isolde and her friend, Ishraq do their very best to clear Isolde's name and get to the bottom of what ails this nunnery. It should be really interesting uncovering the secrets of this mystery, but there's a distance in the way it is written which led me to not become emotionally attached to any of the four characters or to this story. My favourite character is Freize, by far, with his witty banter and humour as well as his practicality that is very much needed to keep Luca fed and safe. I also quite liked how both servants, Ishraq and Freize are able to see things from a different perspective than to Luca, the scholar, and Isolde, a woman of previous high standing. The book's setting is that of Italy in the 1450s and beyond some details of the treatment and helplessness of women in this time period and some superstition, I don't feel as though I've walked away with any greater knowledge of this time in history than I did before I picked up the book. I also found it a little bit strange that 150 pages into this book, the mystery of the nunnery is wrapped up and a new mystery to unfold begins. I wasn't expecting that. I think, as the beginning of the series, it may have been difficult to introduce these characters and also to set up the premise of a travelling group of detectives, almost, who roam Europe in search of scientific answers to rival that of superstitious beliefs which have caused fear amongst the people. Perhaps later books in the series will not have to do as much to set up the story and can dive straight into some better character development or some interesting mysteries to solve. Perhaps. I'm not sold yet, but perhaps you will! I wasn't very fond of this novel either. Like you, my favourite part was the banter between the characters. I really need to read more historical fiction but I just don't seem to have found a good book yet to encourage me into the genre :/ I'm sorry this disappointed you! Great review! Oh I'm sorry to hear that :( It took me awhile to find my feet in historical fiction too. I love historical fiction and was keen to read this but I've seen quite a few lukewarm reviews. Maybe it does get better as the series goes on as you say. I've heard A WORLD BETWEEN US by Lydia Syson, set in the Spanish Civil War, is really good. I LOVED A World Between Us. That was so good!